Sixteen-year-old Sulan Hom can’t remember life before the Default—the day the United States government declared bankruptcy. As a math prodigy, she leads a protected life, kept safe from the hunger and crime plaguing the streets of America. She attends the corporate-sponsored Virtual High School, an academy in Vex (Virtual Experience) for gifted children. 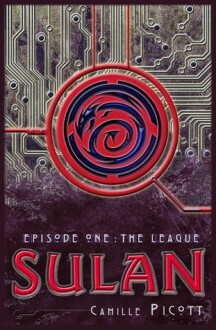 Beyond the security of Sulan’s high-tech world, the Anti-American League wages a guerrilla war against the United States. Their leader, Imugi, is dedicated to undermining the nation’s reconstruction attempts. He attacks anything considered a national resource, including corporations, food storage facilities—and schools. When Sulan witnesses the public execution of a teenage student and the bombing of a college dorm, she panics. Her mother, a retired mercenary, refuses to teach her how to defend herself. Sulan takes matters into her own hands. With the help of her hacker best friend, Hank, Sulan acquires Touch—an illegal Vex technology that allows her to share the physical experience of her avatar. With Touch, Sulan defies her mother and trains herself to fight. When Imugi unleashes a new attack on the United States, Sulan finds herself caught in his net. Will her Vex training be enough to help her survive and escape?